Few things quicken the pulse of a veteran performer like stepping back into the spotlights after such a long time away. The year just past saw that phenomenon happen for many of the biggest names in music: The Police. Led Zeppelin. Garth Brooks. And now, Doyle & Debbie. As one-half of the big dogs on the top rung of the fourth tier of country music’s greatest duos, Doyle Mayfield has seen his share of the triumphs associated with limited regional success. 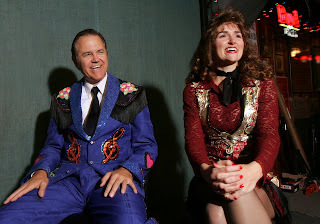 In the late ’80s, you could barely turn on your radio in western Idaho and south central Alabama and wait five or six hours without hearing Doyle & Debbie’s breakout hit “Stock Car Love,” which Mayfield performed with first partner, later second wife, Debbie Gentry. Neither Darlene Mayfield Schwartz nor Debbie Gentry Mayfield could be reached for comment. After Mayfield and Gentry married in 1989 and as the first incarnation of Doyle & Debbie toured relentlessly into the early ’90s, hits like “Grandma Flickertail” and “Whine Whine Twang Twang” made their way onto low-power radio stations and truck stop compilations alike, filtering back to Mooney’s Gap, Tenn., one of Mayfield’s five childhood hometowns. It was back in Mooney’s Gap where those recordings made a dramatic impact on young Debbie Purdy, who had her own dreams of stardom, albeit dashed by very early motherhood. As the early ’90s rolled along, the dramatic changes taking place in the country music business mirrored the turmoil in Mayfield’s life. In the midst of a 1993 promotional tour stop in Uvalde, Texas for their latest single “Coochie Coochie Coo,” Mayfield meets another young singer named Debbie, surname Cochran, and decides to take her on as the first client in his short-lived management firm, El Pollo Diablo Productions. “I had a certain fondness for mescaline at the time, so I’m not sure what I was thinking, bringing two Debbies into my life at the same time,” Mayfield says. It was the transition into 1994 that showed the most potential for success for the act, rechristened “Doyle & Debbie & Debbie” for single long weekend in Reno before dropping back into the more familiar duet formation with Cochran now in the primary Debbie slot, and Gentry taking an “extended hiatus” from touring, which lasted until her divorce from Mayfield in March of 1995. With Cochran in the fold, Doyle & Debbie notched another moderate hit in Utah with “When You’re Screwing Other Women.” D&D were poised to jump into a much bigger spotlight with “God Loves America Best,” which was scheduled to be the theme song for George W. Bush’s first gubernatorial campaign in Texas, until an unfortunate incident at one of the first campaign rallies, the details of which remain sealed by federal court order to this day. Meanwhile, back in Mooney’s Gap, Debbie Purdy embarked on what she imagined would be her final pit stop on the race to the checkered flag of superstardom with a New Year’s Eve gig at the Mooney’s Gap VFW Hall. Little did she, or eventually her three children, know that the one night stand would turn into 12 years of performances on that tiny stage. “They were so good to me at the VFW,” Purdy says. “They even gave me a little plaque the night I sang ‘Stand By Your Man’ for the 10,000th time. I was touched they kept count. Debbie Cochran Mayfield Stephens O’Leary could not be reached for comment. April “Debbie 3” White, Shelby “Debbie 4” Miller, Jackie “no, not that one” Collins, Jacquelyn “Debbie 5 and 9” Parker, Shelley “Debbie Mark VI” Parker, Jennifer “Debbie for a Day” Kirby, Loren “Debbie 8” Dennihy, and Jasema “Debbie X” Colley all could not be reached for comment. That’s also not to say Mayfield didn’t attempt to make it big on his own, albeit in a slightly different fashion. In August of 2000, Mayfield attempted to challenge comedian/newly minted Monday Night Football commentator Dennis Miller to a fight after Miller’s off-hand comment about touring a Nashville “sequin mine” during a preseason broadcast. “That got me fired up right quick, some know-it-all Yankee comin’ to my adopted hometown and sayin’ something like that,” Mayfield remembers. “Once I found my keys and got that Geo Metro jumped, I high-tailed it to Adelphia Coliseum and waited for that no-good so-and-so to come out. Representatives for Miller, the Tennessee Titans, the National Football League, and Fox News Channel could not be reached for comment. It wasn’t until six weeks ago that Doyle Mayfield’s collision course with fame got back on track when, back home in Mooney’s Gap to take care of some unspecified community service, he stuck his head into the tiny VFW Hall for a cold one. There on that tiny stage he beheld his destiny, an angelic singer, warbling the distaff hits from the Doyle & Debbie catalog, and already named Debbie. 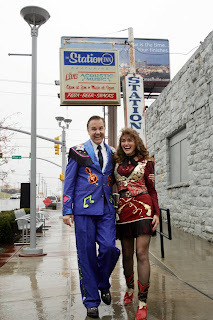 In the very short time they’ve been together, Mayfield and Purdy have already added two new songs to the act, the linguistically poignant “ABC’s of Love” and the destined-to-be hit “For The Children,” which Mayfield is already shopping around Music Row. 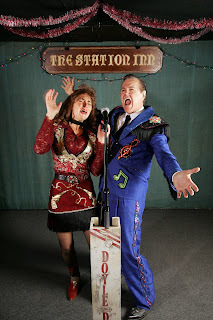 News of the newly reconstituted Doyle & Debbie spread throughout the entertainment community like wildfire. Late night talk staple Conan O’Brien was the first in line to grab the duo for his show, with Doyle & Debbie scheduled for an appearance this Friday, even if Purdy isn’t quite sure who O’Brien is. “That’s mighty fine, Debbie,” Mayfield replies. “Thank you, Doyle,” Debbie concludes. Wonderful. I am a long-time fan and always wondered about the back story. Thanks for making it available to us all.